Senior Quinton Kammerer delivers the first pitch for the Cardinals. The Brodhead-Juda baseball team got off to a hot start last Tuesday when they hosted Albany-Monticello for a battle of the coops. Following a rough 3-21 season the Cardinals look to turn thing around. 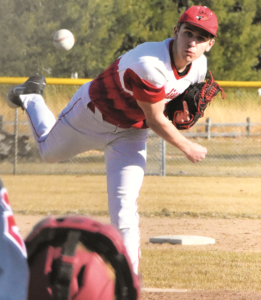 Head Coach Aaron Guilbault expects them to do exactly that as he said “We are going to be improved defensively, offensively, and on the mound.” Guilbault, entering his fourth season as head coach of the Cardinals, carries a 25-45 career record as he has worked long and hard to flip the Brodhead-Juda baseball program around.